It is a joy and a thrill to learn the gender of your baby. Having the opportunity to share that special moment with family and friends makes it that much better, and it is most certainly an occasion for a party! Gender reveal parties let everyone in on the fun, so it’s no surprise they have gotten so popular in recent years. Everyone from party stores to your local bakery have gotten in on the trend, making it fun and simple to share the exciting surprise with your loved ones. If you’re thinking of having a gender reveal party, we’ve put together some ideas to help you plan your special day. If you are planning a gender reveal party, the first thing you need is the big news. At your ultrasound, have the ultrasound technician write “boy” or “girl” on a slip of paper in a sealed envelope. If you’re doing something like a cake or a balloon reveal, you can give the envelope to the bakery or party store and have them prepare what you need without telling you. If you’re having a friend or family member (who can keep a secret) plan the party, give them the envelope and let them make the arrangements for your reveal of choice. Then you’ll be all set to get the exciting news together at your party and celebrate! Once this first step is completed, you’re ready for the party planning. If you are unsure of how exactly to turn a gender revel into an event, here are ten creative options to choose from. If the mom-to-be loves frilly, feminine things, or is just craving cupcakes, this is a fun idea. Deck out the party with pastels of every color, have tea and petit fours and yummy delicacies with pink and blue garnishes to keep everyone guessing. Have a special cupcake or confection made with a pink or blue candy center and have the parents to be cut into it to reveal the baby’s gender. This is one of the more stylish themes on the list. Have everyone dress in black and white and keep the same color theme for the party décor to keep an air of mystery until the big reveal. This is a great theme if you wish to have an oversized gift box wrapped in black and white paper for the parents to open and reveal pink or blue balloons inside. The black and white décor will be the perfect backdrop to make the bright splash of pink or blue stand out. A pull-string piñata is a great way to have a reveal at a laid-back, casual outdoor cookout. Have a neutral colored piñata filled with either blue or pink confetti or candy, when the time is right, simply pull the string to release and reveal the baby’s gender. Powder bombs are a super-fun (and super-messy) reveal idea. If you’ve ever been to a color run you know what we’re talking about. You can get just one or two for the parents-to-be, or get a powder bomb for everyone at the party. 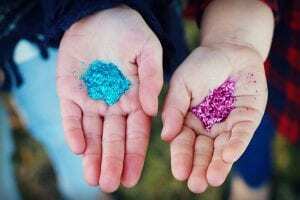 Release them outside to create a colorful cloud of pink or blue powder. Just remember to wear something that you don’t mind getting colored powder on. If your party is at night, glow sticks are a fun way to reveal whether you’re expecting a boy or girl. This is another way to get all of your guests in on the fun. Get the glow sticks that activate when you snap them in either pink or blue. Turn out the lights and snap them together to light up the sticks for your announcement. Who doesn’t love confetti?! Handheld confetti cannons are a festive way to share the news. You can purchase them pre-loaded with blue or pink confetti, then “fire” the cannons to rain down a celebratory reveal. This can work for an indoor or outdoor celebration. Get older siblings in on the celebration by letting them reveal the gender. Wrap a colored, helium-filled pink or blue balloon (wrap one for each sibling). Then have them open and release the balloons together to announce their little sister or brother to the world. For those who are a little more adventurous (and don’t mind getting wet) this is a fun way to do a reveal. Fill a water gun with pink or blue colored water or paint, then soak the parents, or a blank canvas, to reveal the gender. Needless to say, this is another fun idea if you want to get your other children in on the festivities. Smoke bombs are cool, ethereal trinkets that release a swirl of colorful smoke into the air, and they are definitely an idea for an outdoor gender revel party! You can hold the smoke bombs in your hand or have them set in a gift-wrapped box and uncap them to release a plume of blue or pink smoke. A simple, classic way to reveal your baby’s gender at the party is to wrap a pink or blue onesie in a gender-neutral box. Have the parents-to-be open the gift together to learn of the gender of their baby. Whether you want to keep it casual and outdoorsy or plan a glittery formal affair, these reveal ideas can inspire your party and give everyone a memorable moment to treasure. Whichever route you choose, be sure to have the cameras ready as it will be a perfect opportunity for a great photo op you can cherish for years to come. Previous Post: « Fear of Childbirth and Duration of Labor; is There a Link?